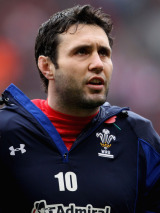 Stephen Jones has carved out a reputation as one of rugby's most reliable fly-half's and holds the record as Wales' most-capped player. He made his international debut as a replacement in the record 96-13 defeat against South Africa in 1998 but forced his way into the 1999 World Cup reckoning for Wales. He was later a key figure Wales' Six Nations Grand Slam in 2005 when he produced arguably the best form of his career. After being heralded as the best fly-half in the Championship his form was rewarded with a place on the British & Irish Lions' tour to New Zealand where he featured in all three Tests. Heading into the 2007 Rugby World Cup Jones was under heavy pressure from the Welsh press regarding his place in the Test side and his ability to captain, fears compounded by his missing out on a starting slot for the opener against Canada. Following Wales' ignominious exit at the hands of Fiji, new Wales coach Warren Gatland relieved Jones of the captaincy. But he re-established himself as a key cog in the Wales machine and selection for his second Lions tour followed in 2009 where he laid claim to the starting No.10 jersey. Jones struggled in the first Test, missing two early kicks in a defeat in Durban but held his own in the second Test in Pretoria playing a key part in Rob Kearney's try and scoring a dramatic late penalty to level the scores at 25-25. Jones' heroics were upstaged however, when Springboks' replacement Morne Steyn kicked the series-winning penalty in injury time for South Africa. Jones kicked 13 points in the final Test to give the Lions a consolation victory in Johannesburg. He is second to only Neil Jenkins in Wales' all-time points scoring charts and became only the second player, after Gareth Thomas, to play 100 Tests for Wales in their controversial cap meeting with the Barbarians in 2011. He was set to make Wales' Test cap record his own later that year but was forced out of the World Cup warm-up clash with England after picking up an injury in the warm-up. Rhys Priestland made the most of the opportunity by laying claim to the No.10 jersey for the World Cup with Jones reduced to a bit-part role. He eventually claimed the record with a tournament appearance against Namibia and saw further action as a replacement against Fiji, France and Australia. On the domestic front, he kicked off his domestic career with Llanelli in 1996 and stayed with the club through the first season of regional rugby, starring for the Scarlets, before opting for a switch to French club Clermont Auvergne. He graced France's top flight for just two seasons before returning to the Scarlets in 2006. He was part of the Scarlets team that powered to the Heineken Cup semi-finals in 2007 and he stayed there until 2012. But ahead of the 2012-13 season he penned a deal with Wasps and towards the end of the season he announced that he would retire to take up a role within the club's coaching staff.